Merrythought London Gold Musical Bear Discounts Apply ! London Gold Musical Bear is made from a quality golden mohair, with contrasting brown pads and satin ribbon. 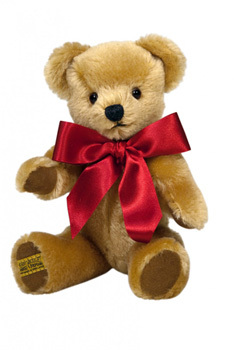 This timeless Merrythought teddy bear is a loyal, lifelong companion for any child or adult to enjoy. This version has a music box in his tummy that plays 'Teddy Bear's Picnic'.